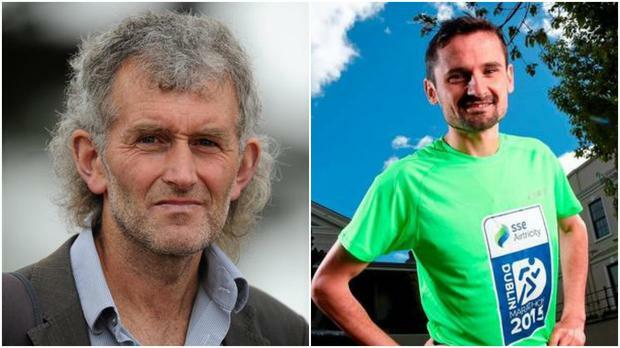 Jerry Kiernan last night blasted Athletics Ireland for what he called their "unfair" decision to pick Paul Pollock ahead of Sergiu Ciobanu on Ireland's marathon team for the Olympic Games. Ciobanu was the third fastest Irish marathon runner during the qualification window, having clocked 2:15:14 at the Berlin Marathon last September, but he has been overlooked in favour of Pollock, who finished six places and 24 seconds behind him in Berlin. Pollock has outperformed Ciobanu at shorter distances since then, most notably at the IAAF World Half-Marathon Championships in March, when he finished 14th in 62:46, almost four minutes ahead of Ciobanu. However Kiernan, who coaches Ciobanu, believes that holds little relevance over the 26.2-mile distance. "Picking a marathon team on the basis of a half-marathon makes absolutely no sense," he said. "It's like picking someone who has run a 400m on an 800m team. "Sergiu is intrinsically a marathon runner. He stays on his feet and gets home. I do not believe he's only the fourth-best marathon runner in the country." Kiernan believes Athletics Ireland reneged on their selection policy by choosing Pollock. "The association kept moving the goalposts. Eventually they said they reserve the right to change their policy as they went along, which is f***ing bull***t.
"If you look at the criteria laid down, you would have to feel Sergiu deserved the gig rather than Pollock. "They all ran on the same day, on the same course and we had an outcome, which was (Kevin) Seaward, Sergiu and Mick Clohisey, with Pollock fourth. "I'm not saying they've got it wrong but I'm not too sure they've got it right." Ciobanu, who was born in Moldova but has lived in Ireland for the past 10 years, was equally upset with the news. "I feel robbed," he said. "I feel that if I was born in Nenagh or Killarney then I would be in that team. "I'm very disappointed, and I'm sure this decision won't give hope to many athletes who tried their best to qualify." Athletics Ireland also named Seaward and Clohisey on the men's team, with 36-year-old Lizzie Lee, Fionnuala McCormack and Breege Connolly comprising the women's team. The five-member selection committee opted for the three women who had run the fastest three marathons in the 17-month qualification period but decided to use a different criterion - as they were entitled to - when it came to the men's team. Ciobanu confirmed last night that he will appeal the decision, which must be done within 24 hours of the announcement. If the chairman of the appeals panel deems there are sufficient grounds, his appeal will be heard by a three-person panel by the end of the week. Athletics Ireland will then forward their selection decision to the Olympic Council of Ireland for approval. Once that occurs, the only remaining option for Ciobanu to overturn the decision would be to take his case to the Court of Arbitration for Sport in Switzerland. Kevin Ankrom, high performance director for Athletics Ireland, admitted last night it had been a difficult decision. "It's never easy to tell some of the athletes they aren't selected," he said. "I understand their disappointment."